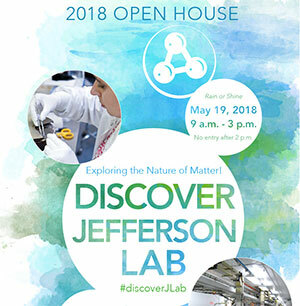 Join us at the Jefferson Lab Open House on May 19! 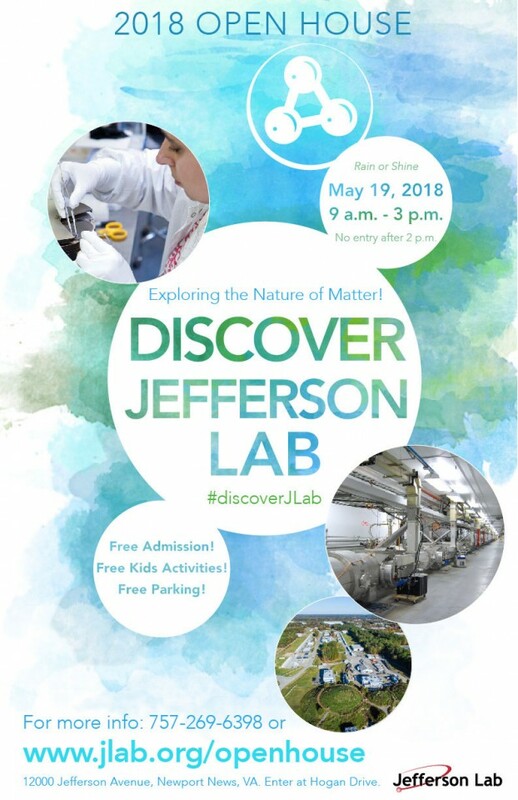 Jefferson Lab’s 2018 Open House event — Discover Jefferson Lab: Exploring the Nature of Matter — will be held on Saturday, May 19, 2018. Event hours are 9 a.m. - 3 p.m. The event provides the public with an ideal opportunity to explore this world-class research facility and features tours of research areas; lectures; and numerous exhibits, demonstrations, and hands-on activities. During your visit, you can learn about superconducting materials, supercomputers, particle accelerators, particle detectors, nuclear physics research and much more. Admission is free and so is parking. Visitors are welcome to take photos and videos. There is a lot to see and do at the Jefferson Lab Open House. Some simple preparations will help you make the most of your open house experience. Review the program under "Things to do" in the weeks leading up to the event. More information will be added as it becomes available. Dress comfortably. The event tours involve extended periods of walking, and many tour stops include stairs. Much of the event is outdoors, so check the weather and dress appropriately. We suggest sunscreen and comfortable, flat, closed-toe shoes. Review the material under the Driving, Parking and Walking Directions and Other Information. The Thomas Jefferson National Accelerator Facility is a world-leading nuclear physics research facility sponsored by the U.S. Department of Energy's Office of Science. Research at Jefferson Lab is expanding humankind's knowledge of the universe by studying sub-atomic particles known as quarks and gluons. These building blocks of matter combine to form the protons and neutrons found in the atom's nucleus. To learn more, scientists have embarked on a journey of discovery into the heart of matter using Jefferson Lab's Continuous Electron Beam Accelerator Facility. CEBAF acts like a giant microscope, using a highly focused beam of electrons to probe matter. It does this by propelling an electron beam at nearly the speed of light into targets located in the lab's four experimental halls. When the beam strikes a target, these interactions are recorded and studied. These incredibly powerful electron beams and unique detector systems allows scientists to "see" things a million times smaller than an atom. To understand the information collected during these experiments, Jefferson Lab scientists develop theoretical models and carry out sophisticated computerized simulations of the interactions. Integrating experimental results and cutting-edge theories helps scientists gain a better understanding of the building blocks of matter and the forces binding them together. • Jefferson Lab's accelerator operates at temperatures colder than deep space! • One third of the Nuclear Physics Ph.D.s awarded in the U.S. are a result of work conducted at Jefferson Lab. • Nearly 2,500 magnets in 81 varieties focus and steer the electron beam in the CEBAF tunnel and range in size from a few inches to three yards and weigh as much as five tons. • Nearly 1,600 scientists from around the world conduct experiments at Jefferson Lab. • More than 750 people are employed at the lab, with a daily site population (staff, contractors, visiting researchers, students) of more than 1,000. • A $338 million upgrade to Jefferson Lab's Continuous Electron Beam Accelerator Facility was completed in 2017, doubling the beam energy of CEBAF and adding new research capabilities. • Today, our Experimental Halls collect 45 Terabytes of data per day, the equivalent of more than 150,000,000 books, and we expect to more than double this rate for Fall 2018 and beyond. • More than 10,000 cubic yards of concrete were used in the construction of the Hall D complex, enough to fill 1000 cement trucks! The biennial open house features tours of the lab's unique particle accelerator facilities, as well as hands-on activities, interactive displays and demonstrations. Open house event visitors typically get a rare opportunity to see the recently upgraded Continuous Electron Beam Accelerator Facility accelerator and experimental halls, where scientists from around the world are carrying out groundbreaking research to understand the basic building blocks of matter. In other displays, Jefferson Lab's scientists and engineers will show how advanced particle accelerators are built and tested, how supercomputing technology is used to capture and analyze data, and how the lab's unique capabilities are transformed into usable products through our technology transfer program. Spend 20-30 minutes at each tour stop to learn a little about everything we do, or just visit the exhibits that interest you the most – the choice is yours! See the six-ton, 27-foot long superconducting cryomodules used to speed the electron beam, and the powerful magnets used to focus and steer it. • Get your picture with the accelerator at the exclusive underground selfie stop. • For in-depth questions about the CEBAF Accelerator and its components, consult our expert accelerator scientist at the end of the tour. This is the place for STEM activities! • Visit our Data Center to learn how we use our super computers for science, while keeping them safe with cyber security. • Learn about advancing efforts to bring an Electron-Ion Collider from concept to reality. • Immerse yourself in a variety of scientific fields, with exhibits provided by partner research organizations, universities and the Department of Energy. • Discover science 'magic' you can do at home with featured hands-on activities presented by the lab's Science Education department. • Watch liquid nitrogen demonstrations in the auditorium every hour on the hour from 10 a.m.–2 p.m. Appropriate for kids of all ages. • Come meet with our HR team to discuss how you can contribute to amazing discoveries at Jefferson Lab. • Look at the neat items the Jefferson Lab History Archives has collected from lab’s history for display. • Watch a robotics demonstration featuring robots designed, built and operated in competitions by local middle school students. Peek inside our accelerator's refrigeration plant to see the equipment that can cool things within a few degrees of absolute zero—colder than space! Our refrigeration plant features two, 2 Kelvin cryogenic refrigeration units that are the largest single plants in the world. Between them, they cool 65,000 liquid liters of helium when operating at 2.1 Kelvin. Our refrigeration plant features two, 2 Kelvin cryogenic refrigeration units that are the largest single plants in the world. Between them, they cool 65,000 liquid liters of helium when operating at 2.1 Kelvin. Talk with lab researchers, engineers and technicians about their efforts in Hall A, and get your hands-on science fix with more interactive demos and displays from local universities. Enter the smallest experimental hall on the Jefferson Lab campus, which hasn’t been available to tour for the Open House event since 2014. Inside, you’ll be able to explore CLAS12 - the CEBAF Large Acceptance Spectrometer at 12 GeV. • See how scientists use our two superconducting magnets - the Torus and the Solenoid - to measure particle momentum. • Explore the experimental targets used through the years for research. • Learn about various detector systems in use in Hall B and other experimental halls, including drift chambers, time-of-flight systems, calorimeters, silicon trackers, Cherenkov detectors and micromegas. • Talk with the scientists, engineers and technicians who designed, built and run these systems to find out how Hall B can collect terabytes of data per day. View the enormous detector systems in Hall C and talk with the scientists, engineers and technicians who designed, built and run these behemoths and find out what they are learning. • Get your hands-on science fix with an activity simulating it’s like to conduct research via Rutherford scattering. • Watch detectors collect signals from cosmic rays in real-time as they rain down on Earth. • See what detectors are made of and explore the properties of their component parts. • Find out what it took construct one of the newest detector systems on site: the Super High Momentum Spectrometer. Walk through Hall D's Counting House and into the hall itself. Learn how the research in Hall D may help answer the question: Why is one quark never seen alone? Visit the nerve center of the lab's Continuous Electron Beam Accelerator Facility (CEBAF), where operators monitor and control several hundred thousand signals. • Learn how we accelerate electrons. • Pick the brain of an accelerator physicist at Ask a Scientist, including one of our fomer lab directors. • Check out a real, working bubble chamber. See how companies are using technologies licensed from Jefferson Lab to improve and create new products to benefit the public. Learn about bright ideas that are enabling world-class research in the accelerator and experimental halls. The Test Lab is where Jefferson Lab conducts world-class research and development for accelerator components. • Cooperate with your colleagues to successfully fire an accelerator. • Witness superconductivity at work and find out why it’s important for our CEBAF Accelerator. • Learn about making a superconducting accelerator module. • Get your limited-edition balloon that celebrates our favorite refrigerant. • See how we build accelerators, from beginning to end. • View a prototype accelerator injector system. Set your own waves in motion on an enormous working wave machine that uses dual catenary lines under 500 pounds of tension to resonantly transfer energy from one end to the other. Shuttle buses continuously loop around the Jefferson Lab campus and parking lots to connect guests to marked exhibits. You can also walk the entire tour route; it is approximately a two-mile loop. The Accelerator Tunnel and Experimental Halls are not handicap accessible. Exhibit locations with access by steep incline or stairs are denoted on map with . Motorized assistance vehicles will be located on the accelerator site to help transport visitors with mobility restrictions, as available. 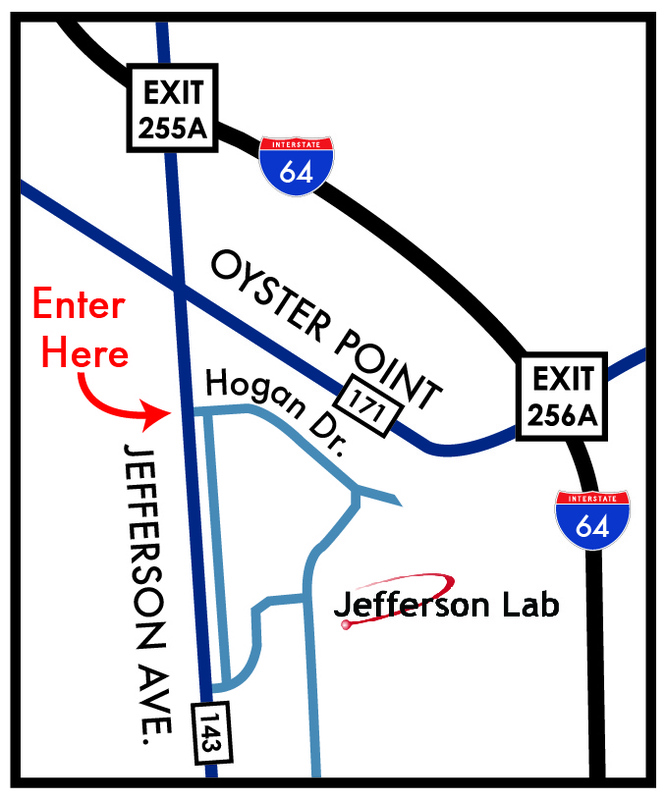 Pedestrians: Individuals planning to walk onto Jefferson Lab for the open house are asked to enter the lab by using the crosswalks at the intersection of Jefferson Avenue and Hogan Drive and then follow the marked pedestrian path to the Welcome Tent. • then take exit 255A onto Jefferson Avenue. • take exit 255A onto Jefferson Avenue. • follow the signs, and directions given by event parking staff. Parking lots will be labeled with numbers or letters (i.e., A, B, C, D, E, and/or 1, 2). Before leaving your vehicle, please note which lot you park in. Individuals under 16 must be accompanied by an adult. Bags, satchels, backpacks and IDs will be checked by security officers prior to entry to the event. Handicap parking will be available. Make sure the handicap sticker on your license plate or in your windshield is clearly visible and you will be directed to handicap parking. Parking will be available for busses and large vans. Please follow the directions given by parking lot attendants. Bring your camera or smart phone device; photos and video-recording are permitted. Wear sturdy, comfortable walking shoes, and sunscreen and sun glasses or a rimmed hat and protective clothing (a long-sleeved shirt to act as sun screen). Carry some pocket money in case you should want to purchase snack-type refreshments. Empty, personal-use water bottles may be brought onto lab property and filled with water from water fountains and building taps. Food Vendors: 10 a.m. - 2:30 p.m.
B&G Concessions: Cheeseburgers, Pulled Pork BBQ Sandwiches, Philly Cheese Steak Subs, Hot Italian Sausages, Chicken Tenders, Pulled Pork Cheese Fries, French Fries, Cheese Fries, Soft Drinks and Bottled Water. City Center Ice Cream: Frozen treats mixed before you. Prost! Food Truck: Old world tradition. New world taste. Prost! Food Truck features classic German fare throughout the Tidewater region. Quark Cafe: Grab & Go Breakfast, Lunch and Snack Items. Taste of Brazil: Authentic Brazilian Cuisine. Big Daddy's Kettle Corn: Kettle Corn and Funnel Cakes. Bojangles’: Famous Chicken ‘n Biscuits. Nothing Bundt Cakes: Nothing Bundt Cakes are available in single serving "Bundtlets". Nothing Bundt Cakes flavors include: Chocolate Chocolate Chip, White White Chocolate, Red Velvet, White Chocolate Raspberry, Carrot, Lemon, Marble, Cinnamon Swirl and Pecan Praline. On the Flip Side: American-Asian Cuisine. Smoke: Old-School BBQ and Southern Cooking. Alcohol, firearms, weapons, knives, explosives and any illegal materials, or pets. • Jefferson Lab hosts will be present to respond to questions and to assist with first-aid needs or to contact emergency medical services. • In case of serious illness, injury or vehicle accident, our medical staff and Newport News emergency medical crews will be on site. • Proper footwear and clothing is essential. 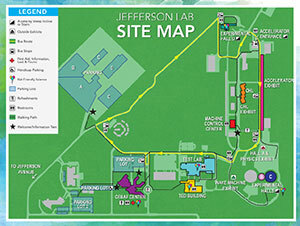 Jefferson Lab is spread over a 206-acre campus, and those taking tours will be required to use stairs and walk some distances. Low-heeled, closed-toe shoes are recommended. Wear a brimmed hat and sun screen or sun glasses and clothing that will protect you from sunburn. Visitors are reminded that Jefferson Lab is a Federal installation. As such, there are many items that are not allowed on the property. Security screeners will check hand-carried items like bags and backpacks prior to entry to the event to ensure the safety of all of our visitors and staff. Prohibited items include explosives, dangerous weapons, firearms, controlled substances, instruments or materials likely to produce substantial injury or damage to property, and other items prohibited under Title 41 of the Code of Federal Regulations, Part 102-74, Subpart C – Rules and Regulations Governing Conduct on Federal Property. Free shuttle buses will continuously follow a large one-way circle route; the buses will stop at every bus stop, and the parking lot bus stops. Estimated wait times are 5 - 15 minutes. Visitors may get on and off the shuttle buses at any bus stop. Visitors may walk any part of, or nearly the entire tour route, via the walking path – shown on the program map and by walkway signs; it is approximately a 2 mile out-and-back path.